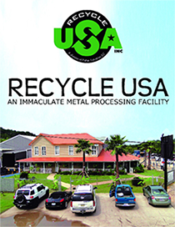 Anti-Spam | Recycle USA, Inc.
At Constant Contact, we take Spam seriously. Many people today are unaware that there is a cost associated with sending unwanted or unsolicited email. For small businesses and non-profit organizations the principal costs are poor reputation and lost revenue. For customers and prospects of small businesses and non-profit organizations, receiving unwanted or unsolicited email is not only frustrating and time consuming; it can also provoke negative reactions towards those who send it. Let’s face it, who wants to patronize a business or make a donation to an organization that doesn’t consider your preferences or respects your time. Likewise, there is a cost to processing and filtering unwanted and unsolicited email. This cost is placed squarely on the shoulders of the internet service providers (ISPs) and mail administrators that filter ‘spam’ from their users. With over 85% of all email traffic today considered “Spam” sent from individuals with malicious intent, there’s no wonder why ISPs condemn the sending of unsolicited email and employ complex filtering to protect their customers from it. With email marketing it’s all about the recipients. Remember, it’s the ISPs and recipients that control the email-marketing channel. Unlike many other marketing channels, recipients can easily react to email they don’t want. It’s as easy as hitting the “Spam” or “Junk” button, or forwarding the email to a third party blocklist. The result? If enough recipients report the mail they receive from a specific sender as unwanted or unsolicited, both the sender and Constant Contact may be blocked from delivering mail in the future. That’s why Constant Contact has a no tolerance spam policy. At Constant Contact we want all of our customers sending emails their contacts really want to receive. Spam, as applied to email, means “Unsolicited Bulk Email”. Okay, so what does “Affirmative Consent” mean? The term “affirmative consent” means the recipient has expressly consented to receive the message, either in response to a clear and conspicuous request, or at the recipient’s own initiative. Oftentimes, senders that receive elevated rates of Spam complaints say “But I’m not sending weight loss product ads or get-rich-quick scams, so I’m not spamming.” This is not necessarily true. Spam has nothing to do with the content within emails (although there are some regulations around what can’t be sent, as well, Constant Contact has a Prohibited Content Policy). It’s all about whether one has obtained prior affirmative consent to send to their contacts. So why is Constant Contact so tough when it comes to Spam? It’s simple really. Our customers expect us to deliver their emails to their contact’s inboxes. Because of our commitment to responsible mailing, we go to great lengths to monitor list uploads, complaints, and other performance metrics to ensure there are no problems. Spam complaints, sending to old or non-existent addresses, and low engagement rates all have a negative impact towards the sender AND Constant Contact, which in turn may cause our mail servers to be blocked. If Constant Contact gets blocked, every customer suffers. Constant Contact’s Compliance team is here to work with customers, because ultimately their success is our success. If we identify a potentially problematic contact list or a customer not performing up to our standards, we’ll first ask a lot of questions. We’ll try and understand their business as well their marketing goals. We’ll talk about their list, their collection practices, and their messaging to try to uncover the root cause of the problem. We may also ask that they try different action plans to remediate the problem. Again, we want to incubate success. But yes, there are times when we determine that a list is simply not consent-based, or is too old or problematic to work with, and we’ll require that it be removed from the account. Also, in certain instances, we’ll ask that a customer find another service provider because our goals are simply not compatible. Gather contacts using affirmative consent.As we’ve already learned, getting affirmative consent from contacts is the number one driver of success. If you’re an email marketer, make sure your contacts are aware and amenable to receiving email from you. Don’t play games with implied consent or hiding your terms in the fine print. Set proper expectations around content and frequency.Let your contacts know exactly the type of content you’ll be sending and don’t stray far from the course. You can do this by showing samples or providing copies of your emails. That way, they can decide if they’re interested in the content or want to hear from you. Remember, it’s about them – not you. In the same breath, tell them how often you plan to mail to them, and stay true to your word. Over-mailing or not mailing frequently enough can cause problems. Letting your contacts know how often you plan on hitting their inbox will set expectations, and again, give them choice. Make your communications relevant and engaging.Email “engagement” is a common buzzword in the marketing industry today. It’s also a metric used by ISPs to help determine blocking or the placement of your email. If your contacts aren’t interested in what you’re sending, they’ll be less likely to open future emails from you. In turn, low engagement may lead to your emails getting de-prioritized, delivered to the junk folder, or blocked entirely. Make a conscious effort to send email that’s relevant to your contacts and promotes interaction. If you have the means, utilize technology to really understand what your contacts are interested in and target your messaging to those interests. Become a trusted and responsible mailer.Success is often measured by your last email. Stay true to your collection methods and follow the expectations you set. Don’t be tempted to deviate or get tricky. Short-term gains made by emailing to non-permission based lists, or sending content that is different from what your contacts expect, will always come back to bite you. After all, it’s your brand we’re talking about here. Why risk ruining your business’s reputation by deviating from responsible practices? Yes. In January of 2004 a federal anti-spam law went into effect in the United States. It’s known as the CAN-SPAM Act. This Act regulates, to some extent, commercial email, establishes requirements for commercial messages, gives recipients the right to have you stop emailing them, and spells out tough penalties for violations. While this new law did not stop spam, it does make it illegal and ultimately less attractive to spammers. At Constant Contact, we applaud the CAN-SPAM Act, but view it as the lowest barrier to entry rather than the pinnacle to which marketers should strive. Because Spam is about consent not content, arguments that mail is CAN-SPAM compliant are often irrelevant. There are also many other laws and regulations around the world surrounding electronic marketing. If you live or work in Canada, or mail to folks who do, you’ll want to be sure to collect and catalog express consent as outlined in the new Canadian Anti-Spam Laws (CASL). While we can’t give legal advice, we encourage all senders to become familiar with these laws, especially if they live in or mail to recipients outside the US. How does Constant Contact help protect against sending unwanted or unsolicited email? Constant Contact’s Compliance team uses the full spectrum of people, process, and technology to ensure our customer’s mail gets delivered. Our highly trained staff uses a variety of tools and criteria to review and evaluate each account throughout their lifecycle. Legal – We require that each customer understands and agrees to our permission-based Terms of Service. In addition, when customers upload a contact list, they must agree that it is consent-based. Education – Constant Contact continuously keeps customers updated on the latest best practices, tips, and email etiquette via our blogs, seminars and training, and award-winning Marketing Resource Center. Collaboration – We’re registered with major ISPs and anti-spam authorities to receive automated feedback loop (FBL) data when any of our customer’s contacts report abuse. We use this data, when warranted, to take corrective action. Verification – Constant Contact automatically sends new contacts using our Join My Mailing List feature an email confirming their interest in receiving emails from you. Additionally, if your contact changes his or her interests or unsubscribes, Constant Contact automatically sends an email confirmation. Unsubscribe – Every email generated from Constant Contact contains an unsubscribe link which allows contacts to opt-out of future emails and automatically updates contact lists to avoid the chance of sending unwanted emails in the future. Identification – Your email header information is pre-set for you by Constant Contact. Your email’s “From Address” is verified and accurately identifies you as the sender. Contact Information – All of your emails are pre-filled with your contact information, including your physical address. If you feel a Constant Contact customer is sending unsolicited email, you can report it to us by sending it to abuse@constantcontact.com. Each email is reviewed and cataloged by a member of the Compliance Team. In addition, we will investigate each complaint and take appropriate action against the sender.